This card has caused quite a lot of comment recently. I made it for a workshop (it was a floral themed workshop) and the stand out question has been about the background stamp. It's an unmounted one by Creative Expressions. I got it from Shopkeeper Gal at Kraft Crazy. I love it. 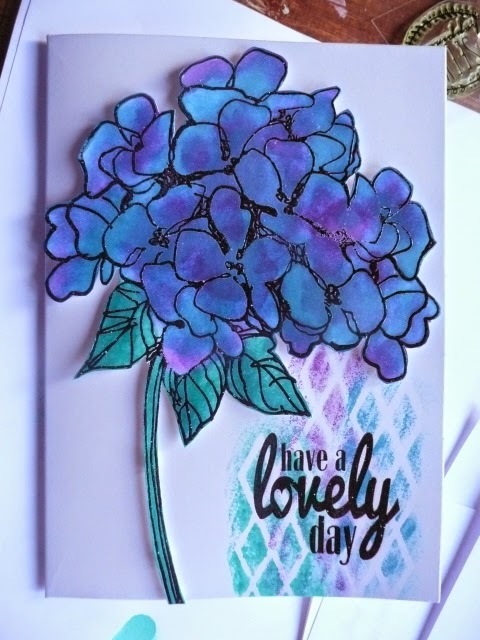 I love too the Woodware solid and outline floral set I've used on this card - very use-able and very versatile, and well, who doesn't like that in a stamp set! I don't know if it was out of the ordinary for me or if the design just hit a spot (see what I did there), but I spent a bit of time making more this weekend, as commissioned. that doesn't happen often. I'm occasionally asked, but have learned not to get involved in Weddings and real multiple orders. Lots of stress, deadlines, sometimes heartache and not a lot of money. 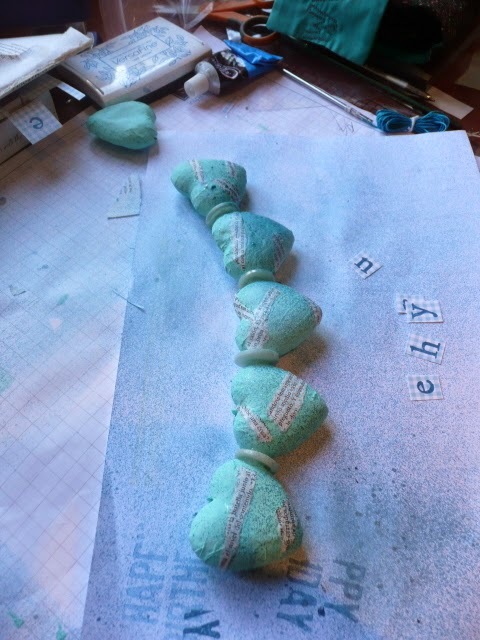 But these were for a friend and I felt they'd be easy to reproduce and fifteen isn't exactly a production line, huh! I think they're rather fun and certainly look great in a random fashion because they are not perfect. 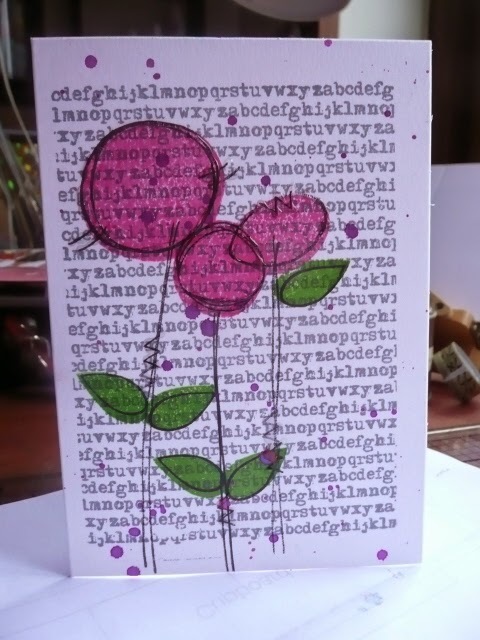 And while I was stamping this, I had another idea that came floating back from my first stamping years....I do love a solid stamp, no doubt. And to go with a solid stamp...ooh, I like me some pearly powder. Watch this space. For while the ideas are cropping up, I don't want to stop! In amongst the apprentice work, the domestic stuff and the hectic champagne social life, I make time to sit at my desk now and then. You know I cut back on the number of workshops I'm doing this year? (don't get an impression of poor me being over worked, it was two a month and now it's one...!). Well, that has freed me up a bit and I've made some cards just for the sake of enjoying my stamps, the process and the therapy. 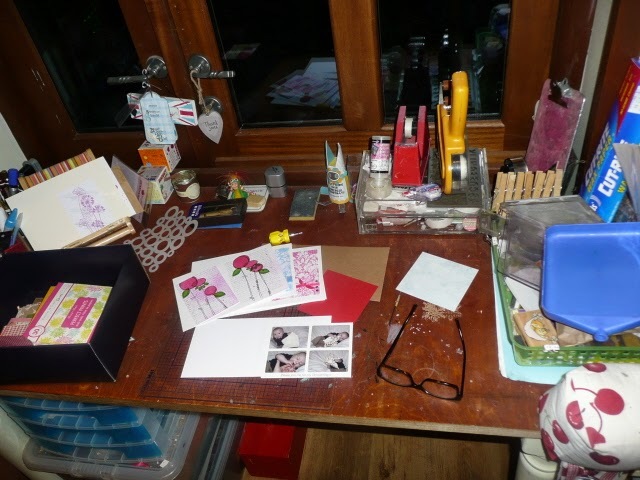 Whereas last year I found I was only sitting at my desk to make workshop cards and they weren't coming easily. I think I'd lost the hobby. Inevitably, some of them turn into workshop cards, especially if it involves a new stamp! 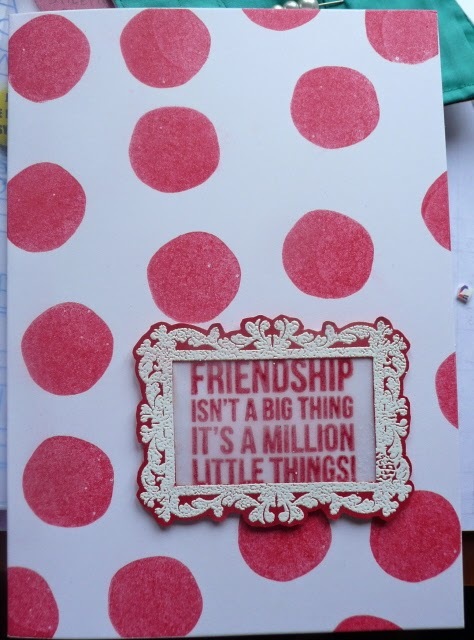 I still make cards just days before they are due, I don't think that will ever change, but I'm actually making them, not rummaging through old workshop cards for something suitable. That's a bit of a joy, it means I can use old stamps too, stuff that I've been looking at and wonder if I ought to get rid of through under use. 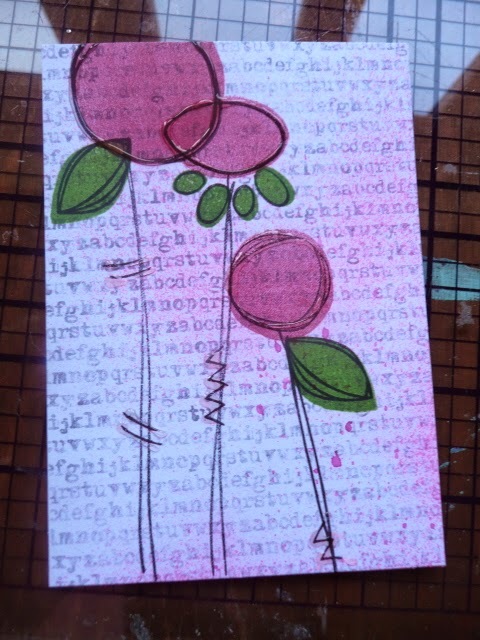 And I'm spending time over indulging when I find a stamp that I particularly like...I make it appear on loads of stuff! I firmly believe that if you want to do something badly enough, you make time to do it, and despite all evidence to the contrary, I also believe that one should talk less about doing it and just well, do it. In my case, that then gives me more to talk about! There seems no escape, gentle reader! What's on Your Workdesk? 303. really. I took this photo on Tuesday lunchtime, because I was unsure about my movements for the rest of the day and tomorrow morning. That's the thing about Mr Dunnit's being used to work alone. He forgets to tell me that I'm required or not and my 'planning' is shot. 'Specially on the days that he comes home for lunch and then casually suggest I go back to work with him - whaaaaa? My afternoon! Anyway...here is Tuesday's....it does look different now...I've put the cards away! There's a couple of cards for workshop samples and the notebook that I use to write the recipe and remind me of the ingredients to take to the workshop. There's a new stamp at the far left by the heat gun..another flower, I can't help it. Next to the iPad stand which is rapidly becoming a blank card stand, is an Artemio box containing two sticks of sealing wax and a Fleur de Lys seal. I love it and was going to use it on a workshop card - but I have to check the shop's fire system first, the wax smokes alarmingly! The rest is just detritus really. In the clipboard - that note says OnPluto and is underlined. I cannot remember what it refers to. I know I was on the phone when I wrote it. If it was you and I that were talking, and it's important, please visit and crack me on the head with the details! Meanwhile, please link your lovely work spaces here..we like to see what you've got and what you're doing. It's good for the crafting soul. 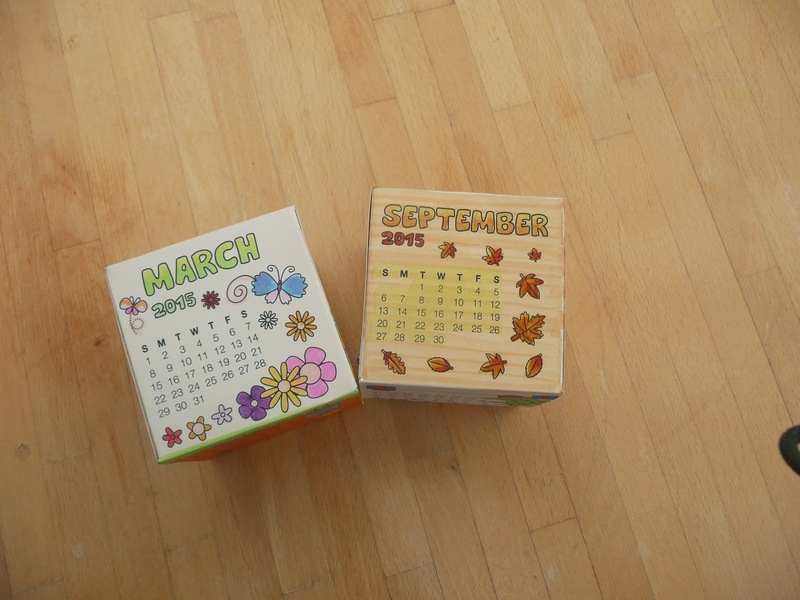 I got these calendar cubes from Baker Ross and distributed them for colouring. They were coloured beautifully, by people very much younger than me. We used my Copics and regular felt pens. They are on a coated board and there wasn't much difference in performance between the pens to be honest. See the striped effect on the November and September sides? That's a Copic...it didn't blend well on this particular surface. The girls didn't mind; I certainly didn't...it's fine! The boxes are pre-scored and easy to assemble; we used glue but it wasn't really necessary. One of my aides-de-camp used ribbon to string hers up for hanging - no doubt somewhere where she can easily see her busy life. One of them (there a five in a pack) was unfinished and I brought it home with me and dumped it on my desk. Some time later, I was out and about with my sister-in-law who made a passing remark about a family birthday that I was unprepared for. Saved me some embarrasment and also gave me a use for the unfinished calendar boxes. 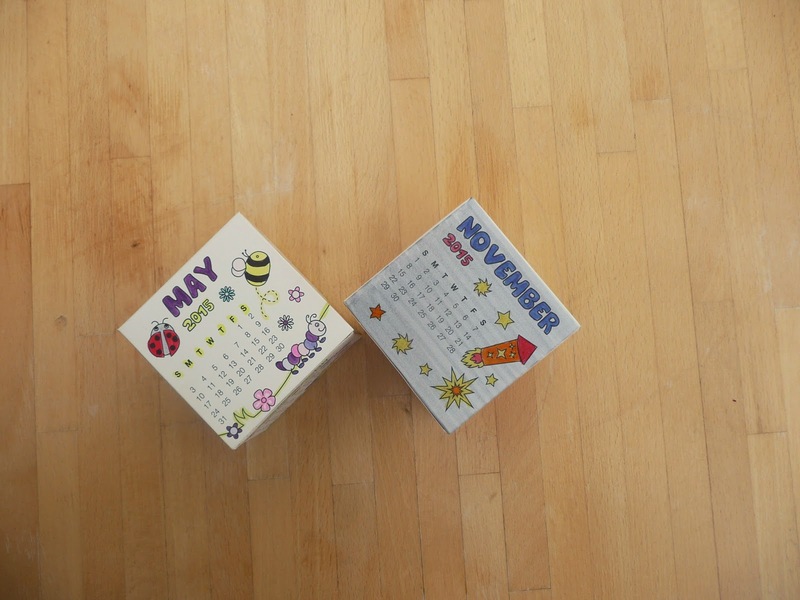 I cut them into individual months, marked dates on one side and names in date order on the reverse of each month. Punched, coralled with a book ring and dropped it in my handbag. 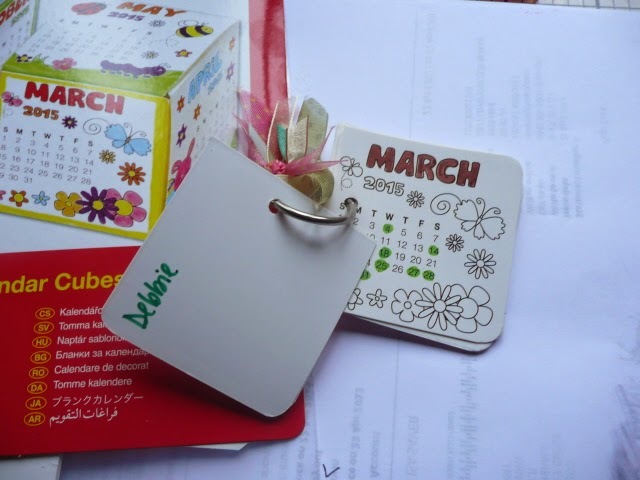 Nice, on-the-go, non bulky, disposable without conscience birthday book. Don't tell me I've a diary. I haven't. Don't tell me I could use my cell phone. I could. But I don't, it's for calls and messaging. My life may be in my handbag, but it's not on my 'phone! This works, and it gave my test audience some fun. Win win! I found these whilst tidying up in my photo files and they make me smile, so I thought to share them. In the last couple of years, there has been a lot of commercial development in the nearest town to our place in Spain; one great success is a huge shopping mall. It has underground and ground level car parking. Now, us English folk park well and where we can. Coming from such a small and crowded island, parking is at a premium and I think on the whole, we are delighted by the sight of an empty car park. Of course, in the blazing southern Spanish sunshine, locals will naturally park underground. You can play 'Spot the Brit' in the ground level park where sun glasses are required to stop your eyeballs burning in the sunshine bouncing off concrete and hire car windows. We are drawn to any empty parking spaces with glee. And an empty one ground level car park is misleading: the first time visitor thinks the place must be quiet. Not a deliberate attempt to fool the Northern European neighbours, I'm sure! Underground parking is always a maze isn't it. Quite apart from the fact that you've to negotiate the first fifty feet in sheer panic because the sudden shade has apparently made you road blind, there's the difficulty of WHERE to park. Often this is made easier by the car park planners...colour coded areas, number and letter codes for row and area and level. Well, at La Zenia, you get it all. And it's free. The pink area is D and E; the walls and paths are striped with pink, each bay is numbered and the pink colour corresponds to that part of the mall that has the food shops and cafes in the majority. And just in case you missed that...there's a dirty great 'statue' depicting food and drink. The blue area is for leisure...and the dirty great 'statue' is a tennis racket and tin of balls. These parking spaces are underneath a huge sports store as well. Some thought has gone into this. My favourite 'statue' is the huge ginormous handbag. But I don't have a picture of it because despite all the codes and numbers, we couldn't get our bearings below ground, and were too tired to go back into the mall and come down to the car park along the handbag route. So if we plan to go shopping in La Zenia Mall and I say to you 'meet you in half an hour at the tennis racket'...you'll know exactly what I mean. If you're considering becoming a Desker, check out the why and the how HERE and HERE. Its very easy and you've nothing to lose. EDITED TO ADD: I got the week number wrong...and I really need this week! Sorry!! If you've been here before, you will without doubt be quite surprised at the clean and tidy state of my desk. I am very well thank you. It is me. 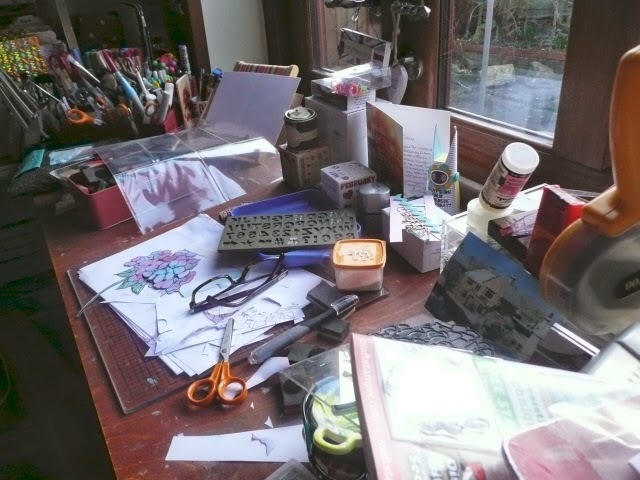 I have tidied up after completing the small selection of cards on the surface there.....because Wednesday is also workshop cutting counting and preparing day, so I need the space. Logic, man. The very dark blue box at left holds paper pads. Not many, because I resist if at all possible. I find them too small really, so they have to be super lovely to make me buy them. There's the circle stencil that I've been using to play about with the bokeh idea...other people's are really lovely. The postcard with the baby pics is actually an invitation to the young man's Christening...how lovely! Of course my glasses - which very badly need upgrading. And just behind them...2 die cut snowflakes....yes dear Deskers..I'm now in the mood! 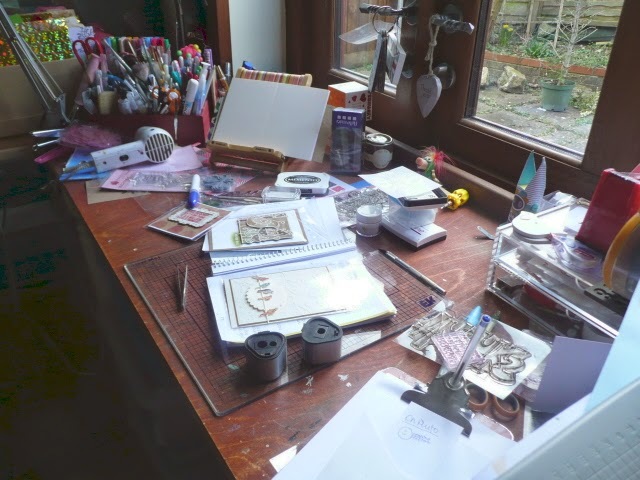 So, while I'm counting and cutting, share a view of where and what you're working on; it's fun, it's free and apart from twinges of envy or full on enabling, it's harmless! Please put WOYWW in your post title and make the post about your desk....Cheers! 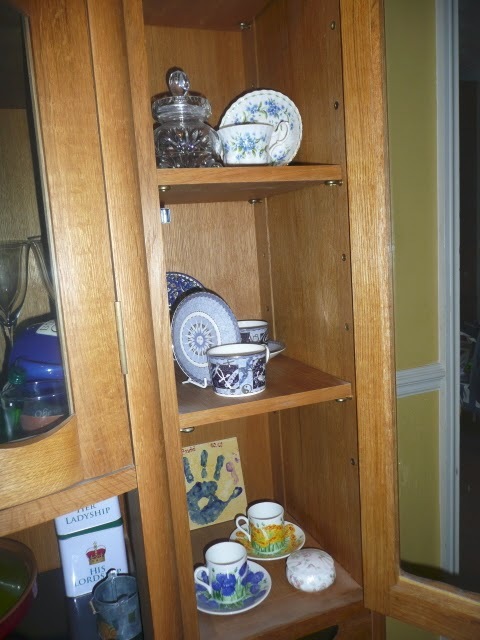 I'm drinking my second coffee of the day and rather than showing you that, which you see a lot of, I thought you may like to see a section of my unused china. I don't consciously 'collect' china, but there is something about practical and beautiful (sic) that I really am attracted to. Inevitably, I have a glass fronted cabinet. You don't live with a Joiner and Cabinet maker (one person, by the way) without owning the odd bespoke piece. If we ever move, this unit will be entirely out of place. It was made for the space it lives in and I can't imagine it anywhere else! Anyway....here's one of the side shelved cupboards. From top to bottom - Royal Albert Flower of the Month cup and saucer - this is July, and it's a Forget Me Not. I used to use it, but although I love it, the style and pattern aren't really me. The middle shelf is very exciting for me. Those are Wedgewood teacups which mark the arrival of the new Millenium. I love them. Classic profile, beautiful semi translucent bone china, traditional methods for production and painting and a modern pattern. Fab. I've never used these. Not because they're too precious though - but because there's only two of them, and when I think to use them, there's always more than two of us who want a cuppa! The colourful florals area again on bone china, they are coffee cans. Demi-tasse. Call em what you will, they're for an after dinner coffee...and we've used them. But again, they are a (non-matching) pair and so have to be used when my table is eclectically dressed in all sorts of mis-matches! It makes my teeth itch to use them when the rest of the meal has been served on a matching service of some sort. And yes, because of a genetic pre-disposition to the love of china and ceramic, I do have a choice! Joining Elizabeth while she sups a cup of tea.. I've talked about my button bag before, but had a lot of questions about it after it managed to appear on my workdesk a couple weeks ago, so here's a re-cap. Treat it as a confession, a warning and advice all in one! This is a Jelly Roll. Or rather, these are Jelly Rolls. 40 strips of fabric, 2.5" wide. I do not know why they are called Jelly Roll and I don't much care. I just accept these things. It's a nice name to go on something that never fails to look as if I should buy it and make something impressive with it. Quilters use them, strip quilts are a lot easier I would imagine, if you can cut out the erm, cutting out of the strips. The thing about having a sewing machine and a little bit of stitch knowledge is that whenever you and your friend visit a fabric shop, you get a twitch and feel the need to get back into sewing. And then, after you've exclaimed over how the cost of patterns and lovely fabric has changed in the twenty odd years since it was your only hobby, you buy something because you can't bear to leave it in the shop. For 'you' gentle reader, of course I mean 'I'. And there is evidence all over this blog of this problem. Anyway. I was visiting our local fabric/quilty shop with a friend who was on a mission to find something specific. It was about the time that I'd taken up crochet - say a couple of years ago - and I was in that lovely phase of thinking I cold do anything. I'd seen talk of people crocheting with fabric and tshirt yarn and I wanted to have a go. I bought a Jelly roll. Then had to cut every strip in half - much too wide. Argh, fraying. Came to terms with it. Then I armed myself with the mother sized crochet hook and started work. After four stitches, I realised I had a lot of joins to make. Cue frantic internet searching for a better way to make a join than a bleeding great knot. Sussed. It was hard work. Made my fingers ache. A lot. And the little bobbles of frayed and fraying fabric stuck to me, the chair, the carpet, the...everything. And I lost count in the circle and so my bag is slightly lopsided. And it needs lining, because I use it for my buttons. But that hasn't yet happened. The large plastic ziplock seems to be just the job for now. Uck, not exactly finished then. But to do that, I'd have to go to the fabric shop with an intent...and I'm scared of myself! I wonder if you'd like to have a quick look at some of the work I did last week. At work. Rather than at my lovely, warm, well equipped, quiet desk with a CHAIR. Look away if you're bored by shop talk! We spent a few minutes in the 'other shed' selecting some oak. The shed should really be called a 'wood store', but somehow just isn't up to such a title! We 'ripped' the oak on the 'big saw'. You know, the one that is really scary. That oak was then pushed through the four sided planer and joined a huge pile of already planed Sapele, waiting to be turned into something. Now this is where I excel, everybody. A big pile of stuff that needs a fairly straight forward action to reduce the pile of unfinished and therefore create a pile of finished. It gives me enormous satisfaction to see the 'pile goes down/pile goes up' thing. Literally seeing my achievement I guess! So, Mr Dunnit removes himself from the picture and I put each length of timber through the Spindle Moulder. Another fast turning cutter, this one set up to add a profile to to the top and face of the timber. Mr Dunnit has already determined which is the best face for the moulding (and we've stacked the pile appropriately) and so I'm masked and ear defended and doing a routine...bend, pick up, feed, three paces left, retrieve, bend, stack. Three paces right and start again. Yes, it is mind numbing after an hour or so, but it's also very free-ing. I think over everything, sort out my mental lists, consider meals, holidays, craft ideas..you name it. And when it's finished...I've helped! In the meantime though..scroll back to the picture of the scary saw...see the oval window in the background? I had no input into that. Likewise, I had little to do with this bathroom vanity unit..because I was busy ripping planing and moulding about 3 miles of architrave. Sounds better than saying that the skilled work is done by Mr Dunnit whilst I do the labouring, don't you think! This was Tuesday, about 5.30pm. Daylight! Bliss. So the mess is a variety of things...the tin of Cut n Dry foam pieces is draped with a 12 x 12 page protector that is split into pockets..I guess for Project Life. Every now and then I like to add one of these to my pages for 'extra' photos that don't quite make the grade for a page of their own but still add to a story. There's a new alphabet mould from Stampin' Up! I've had it a week and have been playing with Crackle glaze in it. The 'release' is great. The crackle glaze is so good though, that the 'crackle' actually just means that every letter comes out in several pieces. Doh! 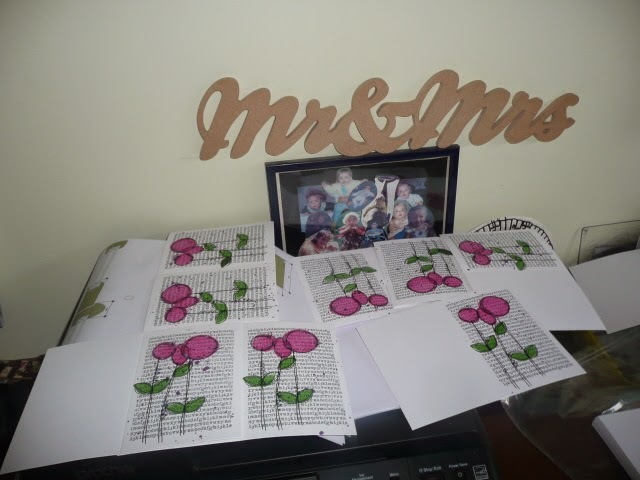 In front and centre is a Stampendous image that I'm working on - as a Mother's Day card. My sweet Mama doesn't read this, so it's safe. It's a beautiful stamp, I just know I'm going to over use it! The usual detritus of the old five minutes here and there routine. The photo propped against the ATG was a picture of their home in the snow, used by my parents as a Christmas card last year. It's waiting to be matched to a paper etc for Crop at the weekend. What? Three months since Christmas? Oh, that's nothing. So...go right ahead and show and tell please, gentle reader. We wanna see. Please put WOYWW in your post title, it really helps. And then use your link number when you visit others - that way you can more easily be visited back! Nice, huh. 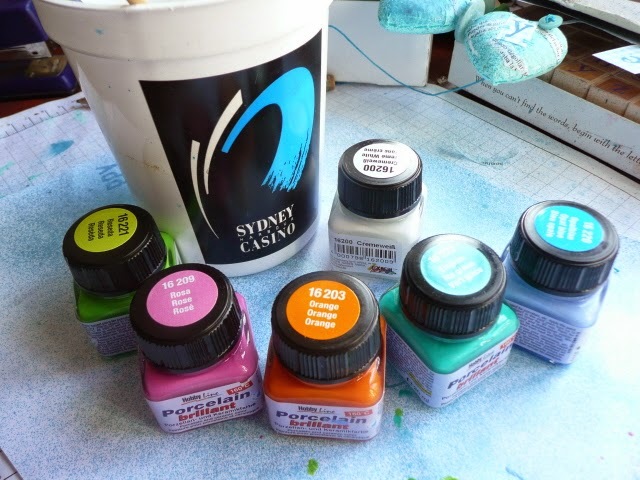 I recently mentioned that I had Porcelain paints on my desk and several people commented that they were surprised. Surprised because they didn't know I did much else apart from cutting and sticking. And probably, because I've never talked about or indeed, shown any propensity for, painting. So true. The lure of the colours was enough really. That Katy at Baker Ross, who supplied these, was sensible enough not to send me anything too taxing. 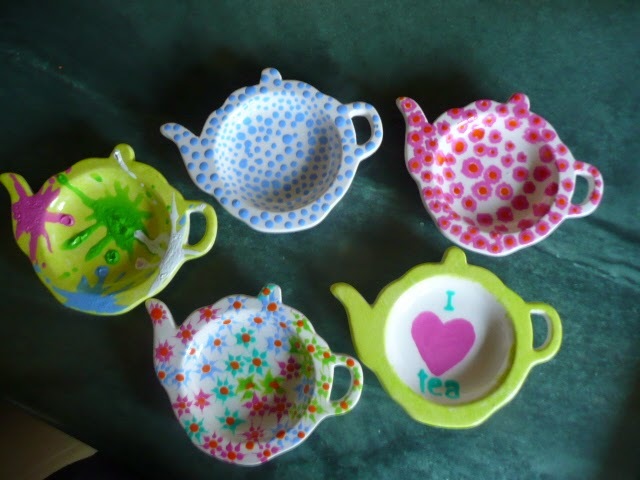 Indeed, I used them and enjoyed using them on these fun teabag/spoon holders. And I discovered something that if you decide to have a go, might help you. Ha! Here's some things to say then. It's a nice opaque paint, but no thicker than oh, say....blood. If you want to something spotty and need control, actually you should paint the spots. 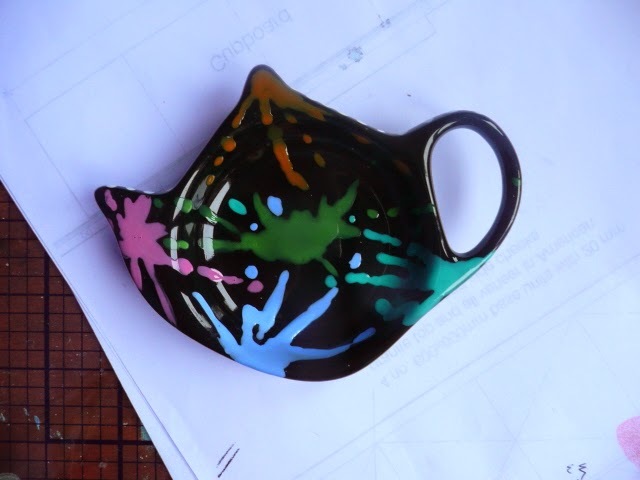 I used the handle end of the paintbrush to dot paint onto the ceramic and as you can see, different sized dots occur. And when I wasn't looking, some of them spread and joined up. Harrumph. Cue lots of trying to wipe bits clean! The blue dots have remained in dimension. Which made me move onto the starry styled pot. First I did a load of teeny dots in the pink. Left them to dry (did not cook them) and then did really teeny dots around each and pulled my pokey tool through each dot to get the starry effect. Again, until I let them run into one another, I was feeling quite pleased with this! I did the pink flowers whilst all the paint was wet and very randomly...some of the 'flower' shapes didn't work out, but that's because I have absolutely no brush skill! I sponged the lime green as a base and frame onto the other two. It worked well, the coverage is smooth and solid. It changed the colour though..the lime green's true colour can be seen as the splash in the centre of the erm, splash designed pot. That's worth knowing about. You can see on the splash design that I used more than a coating of paint..I tried a puddle of colour and then just dragged the brush through it to try to create the splash effect. It was too much and bubbled when cooking. It's perfectly hard and use-able, just doesn't look as I thought it would. As in, I think it was a mistake. As I was doing the supermarket grand prix the other day, I discovered that they sell individual teabag holders. In black. At the cost of three from Baker Ross, I might add. Anyway..I bought one and re-did the splash attempt. Sure did the change the 'wow' factor of the colours - the orange and lime green are really quite dark, huh. Anyway..if you receive a small gift from me in the future, you may expect it to be some painted ceramic..I really enjoyed this sort of mass production. Imagine, if I could actually paint! 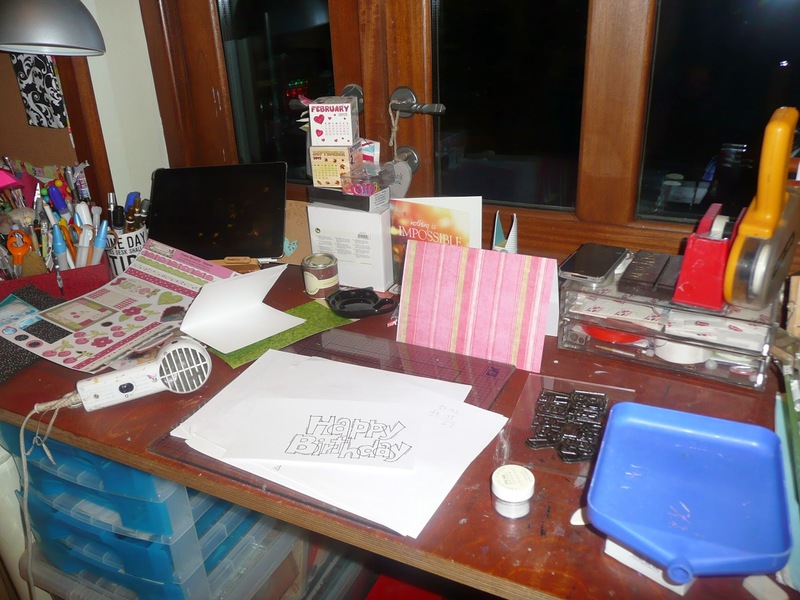 Desker - someone who joins in by posting a photo of their workspace on their blog and linking it here. WOYWWer - someone who visits, comments and enjoys. The number - the weekly count. This week is the 300th time we've come together to show and tell. Believe me when I say the pleasure is all mine; friendships, opportunities, ideas and inspiration that I get from looking at your desks.....worth the cost of broadband. At least. And probably it's best to skate past the amount of shopping I've done as a direct result of the influence of many a Desker. Oh my. Relative tidiness. After the Altered Mushrooms, I realised I had other deadlines. Here you see me between other stuff (like breakfast and dressing) to create a birthday card. No panic, I've got till tea time to sort it out! There is an Appleganza for goodness sake..my phone and my iPad. Both of which, this very week, have been declared out of date and probably too slow for effective use. Charming. My ipad is silent...it's too early. 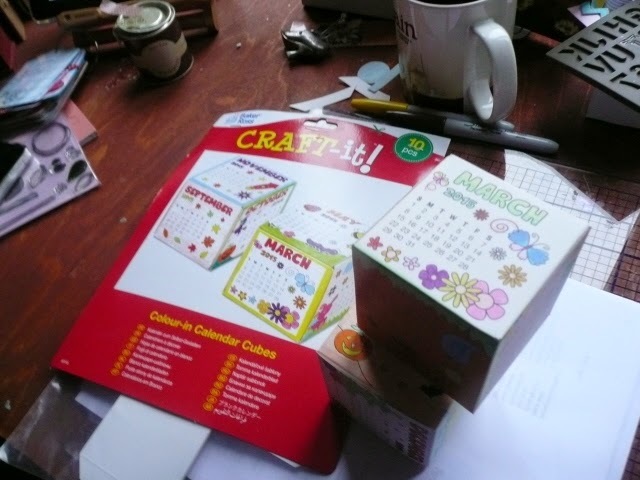 And I've noticed that I need to turn my box calendar too...funny what you see through a lens. There's also another teaspoon/teabag holder in a tea pot shape. Watch this teapot space! Please join in - doesnt matter if this is your 1st, 51st, 201st or 300th join...we wanna know what you're doing and see where your doing it..most important! Put WOYWW in your post title and link here....thank you. Three hundred times, I thank you. 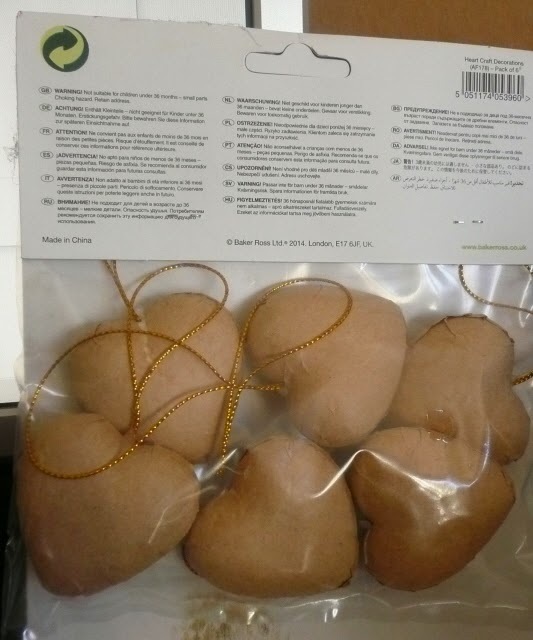 On WOYWW 295, I had a packet of papier mache hearts on my desk that many people commented over. They said that at first glance they could have been mushrooms. Well you know me and altering. I thought that once I'd done something with them, I ought to show and tell. 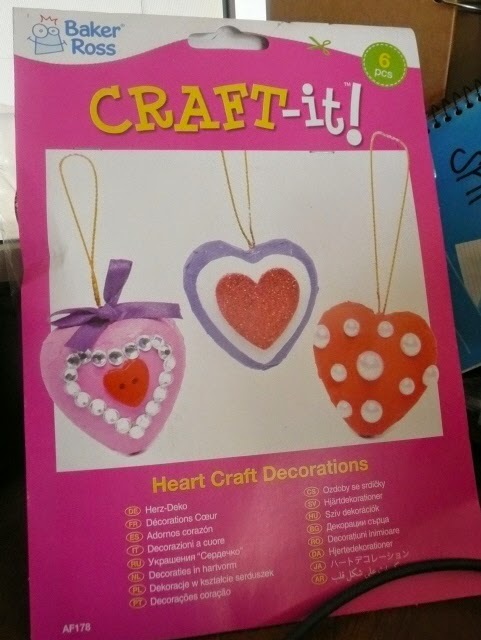 After all, this blog is, according to the strap line, about chunks of paper crafting. I should point out that Baker Ross, who sent me the bag of hearts to play with, sent them in jolly good time for Valentine usage. But of course, that got away from me on account of how I did absolutely nothing for that particular day. No reason. Just didn't! 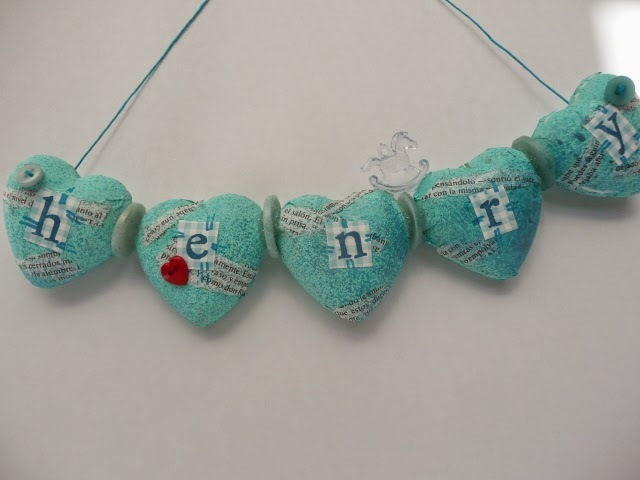 Anyhoooo, I got another idea after I'd received fabulous news about the birth of Henry, and these hearts were perfect. First thing to tell you is that they're polystyrene (styrofoam, to some) covered in kraft...which makes them ideal for painting and other 'wet' mediums. I painted them with acrylic paint and then when dry, squirted them with a nice pearly blue spritz spray thing. One that actually sprays. Always a bonus. Then I stuck them together into a slight arc, using buttons in between each. I used silicone glue (clumsily) because I thought they could do with being a little bit flexible - pva would dry and just ping off the plastic button surface if flexed. See, I do pay some attention! You can see the sixth (now spare) heart. and you can see that I also then stuck on some scraps of old print. This time with PVA because it dries clear and seals. And the rest was easy...stamp Henry's name, glue a letter on each heart, sprinkle some glittery fabulousness over the silicone glue and add a heart button. Because they're not hollow, it was easy to put my pokey tool through them and thread on some twine as a hanger. The button on each end just stops the twine from making the hole unsightly over time. Oh and it adds to the....whatever. I don't have new baby type stamps and papers any more, so these were a perfect answer to welcoming Henry. I think it's very thoughtful to remind a family of the name of its newest member!